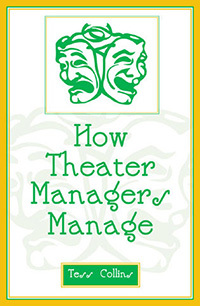 HOW THEATER MANAGERS MANAGE, published by Scarecrow Press, Inc.
HOW THEATER MANAGERS MANAGE brings together the stories, beliefs, and experiences of seasoned theater managers. Through them, a portrait and a concept emerge depicting what they have unknowingly practiced throughout their careers—managerial imagination. Designed to be a stepping stone for new theater managers, this book covers a wide variety of topics including budgeting theater costs, gross potentials and ticket prices, show contracts, settlements, and emergency and security procedures. It includes a sample budget, building and performance forms. Tess Collins has worked for the Shorenstein-Hays Nederlander Organization in theater management for more than 25 years. She managed the Golden Gate, Orpheum, and the Curran Theater in San Francisco. Tess Collins is also the author of three plays: Helen of Troy, Tossing Monte and Barbarians.